Growing up on the East Coast there are some things you have regularly and don’t realize how good they were until you’re gone. A perfect example of East Coast goodness that I often miss living out on the West Coast are bagels ! 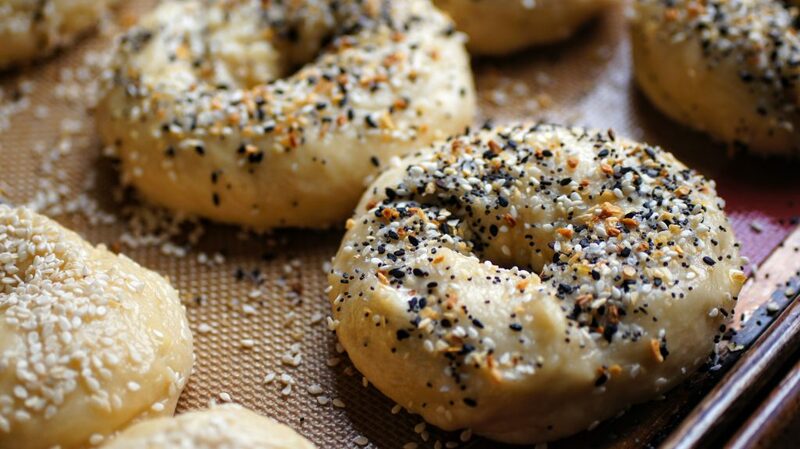 A classic NY style bagel is just perfect: slightly crispy exterior and chewy interior. All the toppings are coated on both the top and bottom to ensure a unique experience of sesame, poppy or everything goodness! Some bagel shops around have definitely been able to muster up some good ones but as a family of 5, buying GOOD bagels on the regular can get kind of spendy, and unfortunately, the grocery store variety just doesn’t do it for me! Enter me. Crazy mom that decides, hey…I can surely take on the bagel category and ROCK IT! After many attempts, lots of tweaking, I finally mastered quite a delicious bagel that is not only amazing, but also fairly quick to make and most importantly kid approved. 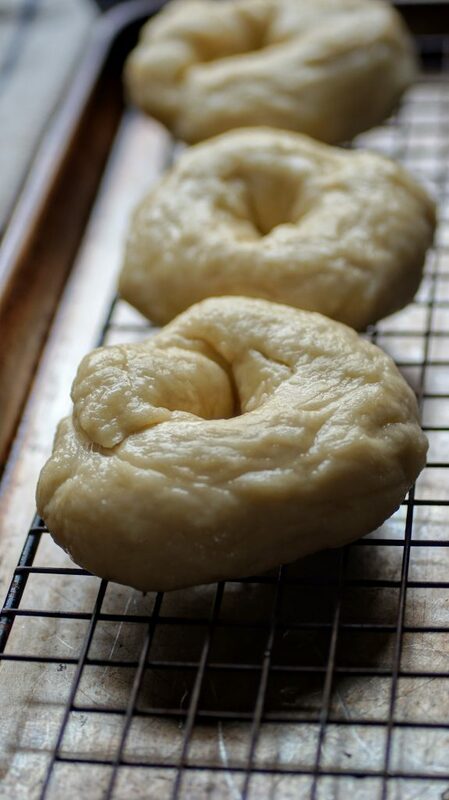 If you are comfortable making bread or pizza dough, bagels aren’t too far off. 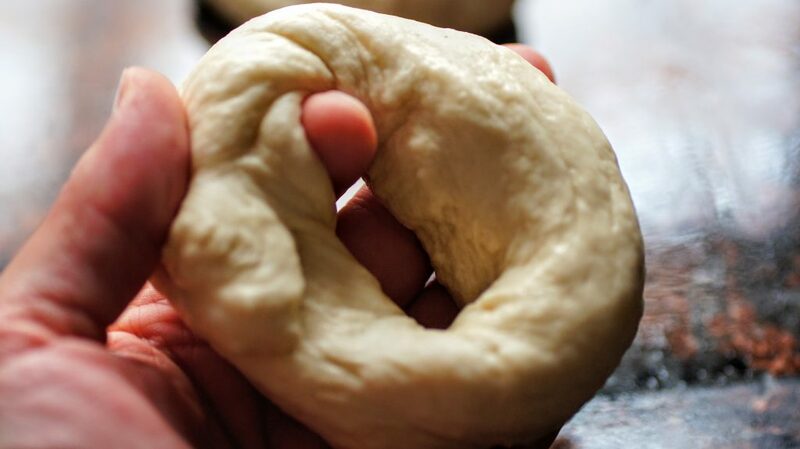 The biggest key factor is boiling the bagels before baking ~ this step CAN NOT be skipped! 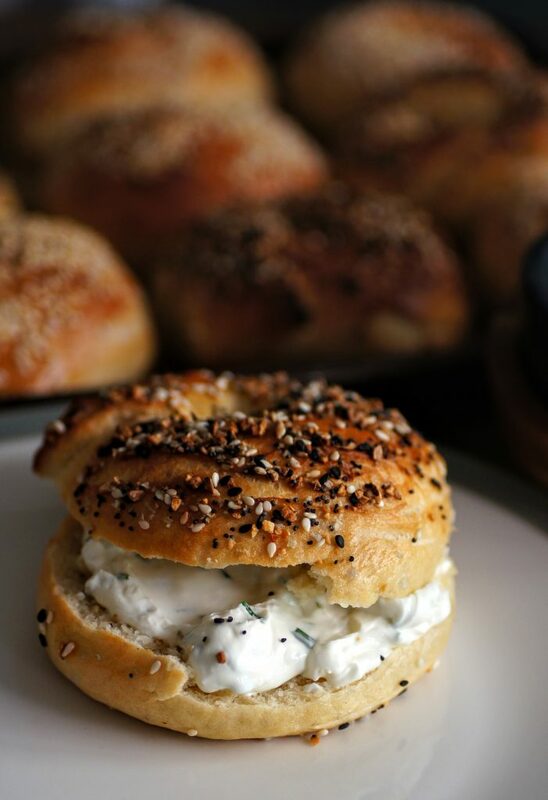 Boiled bagels are what those TRUE bakery bagels are made of. The boiling is what gives the bagels that shiny crispy exterior crust and sheer perfection. Follow my step by step instructions for these incredible breakfast treats. They are sure to impress any guest, especially with a lovely spread of smoked salmon and flavored cream cheeses. I would love to see your creations! Tag me on Instagram @CosettesKitchen or post on my Facebook Page. 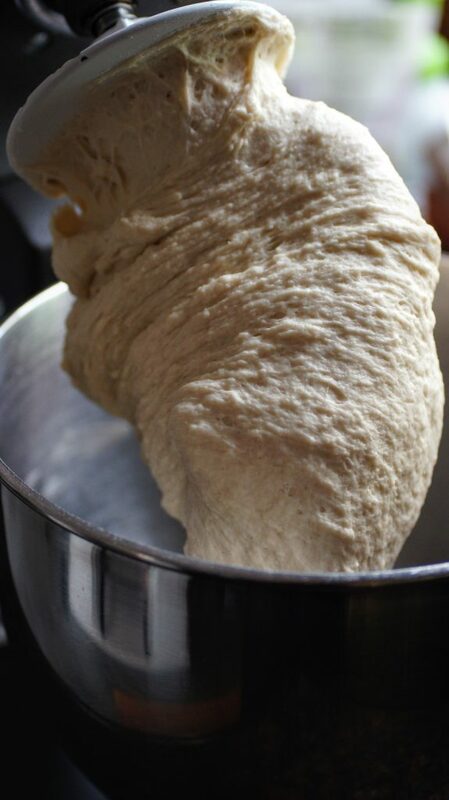 A look at the dough after mixed. 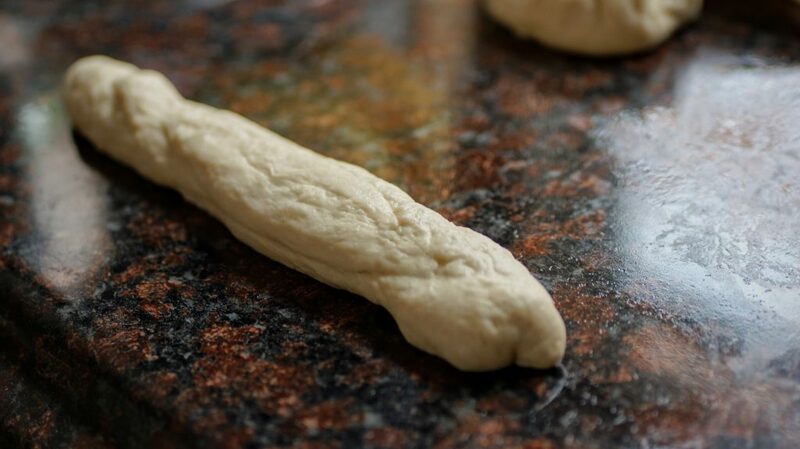 It should be quite dense and will stick to your dough hook. 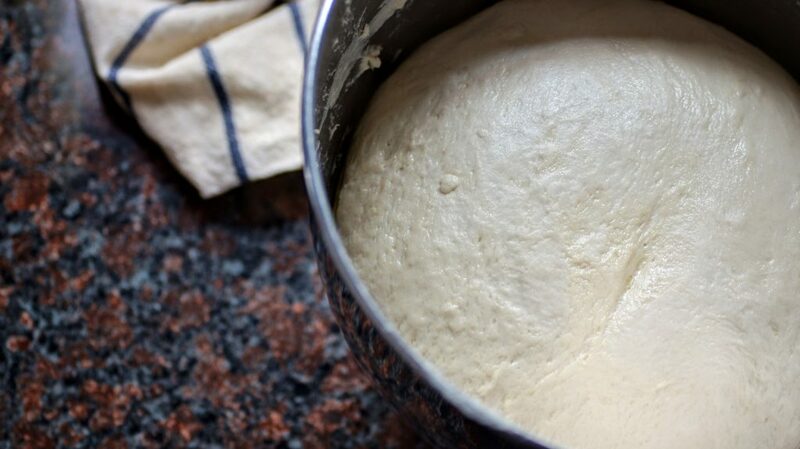 Coat your bowl with a bit of olive oil and place your dough ball in, cover with damp cloth and let rise for about 30 minutes. 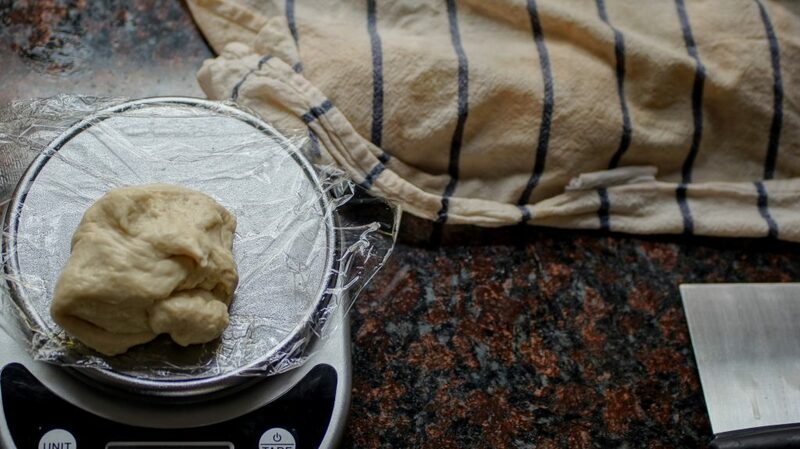 Begin weighing and shaping your dough. 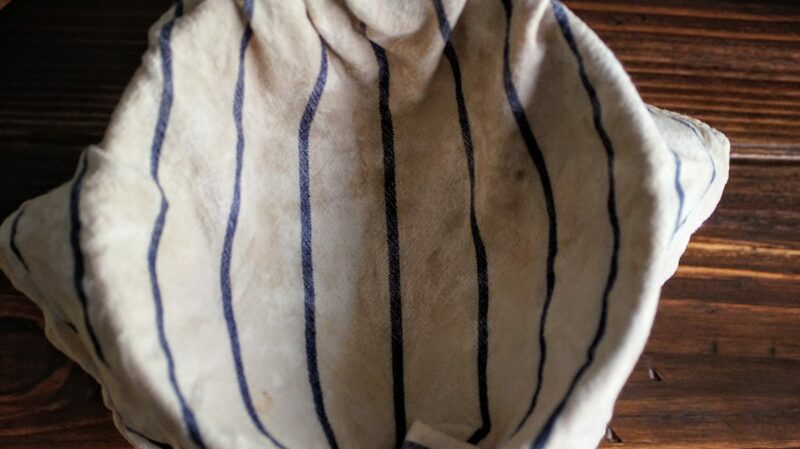 Be sure to keep your dough covered with your clean damp cloth to ensure they don’t dry out. Create a long rope and then begin to shape into a ring, tucking the ends into the opposite end. The dough will not be smooth, it will be a bit crackly. Prepare your pot of water for boiling. Boil for 30 seconds then flip and boil for another 30 seconds. Remove and set on rack. Prep eggwash to coat bagels in seeds. 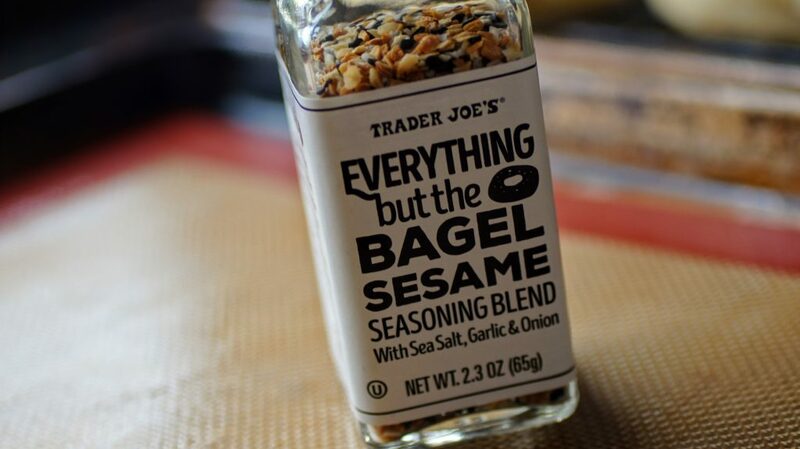 I love the Trader Joe Everything seasoning, and it’s pretty cheap at $1.99! Check out that golden exterior!!! Perfection! 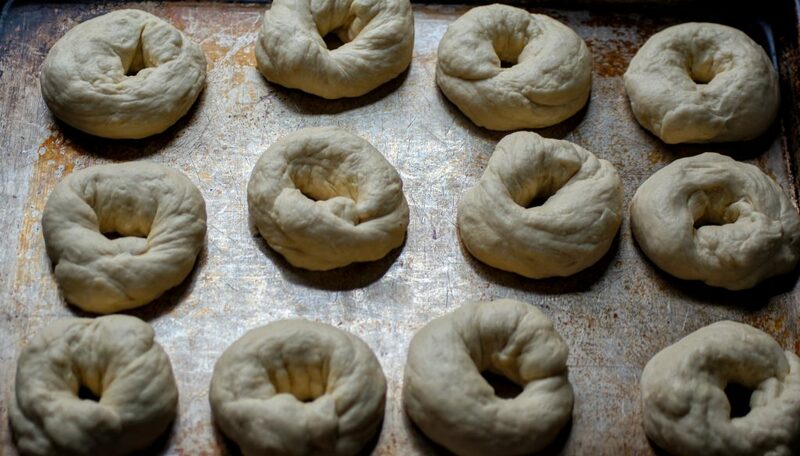 Making a batch of homemade bagels is a great way to liven up any brunch! I love to top with cream cheese mixed with capers, lemon juice and salt. Top bagels with smoked salmon for a special treat. Dissolve the dry yeast in the warm water (about 110F) along with the sugar and 1 tablespoon honey. Set in warm place for about 5 minutes to proof. In the bowl of a stand mixer fitted with dough hook, mix together the flour and 2 tsp kosher salt. Add in the warm water, yeast mixture and mix on low for 2-3 minutes. Increase the speed and mix for about 10 minutes ensuring all the dough is incorporated. Stop mixer and push dough back in bowl as needed. 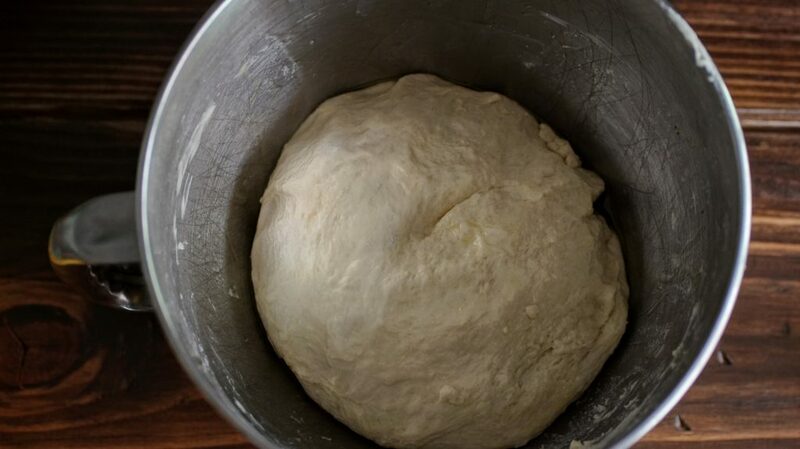 Shape dough into a smooth ball, lightly oil bowl and place dough back in mixer bowl. Cover with damp warm cloth and set in a warm place to rise for about 30 minutes. Dough will not rise significantly. Preheat oven to 425F. 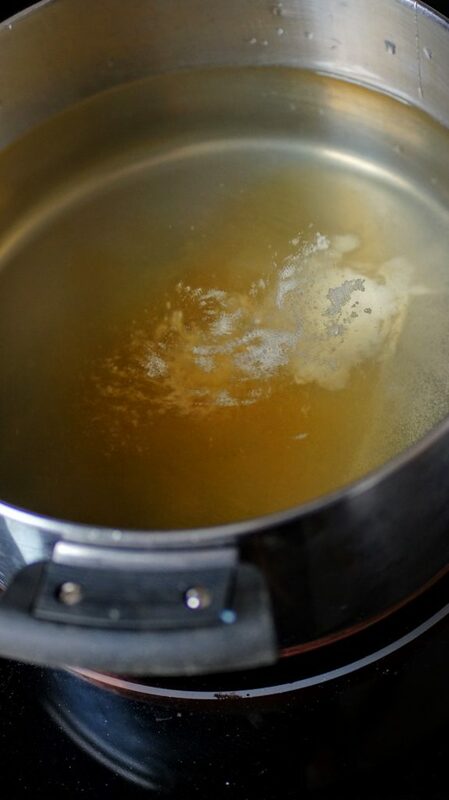 Bring large pot of water (about 4 quarts) to boil, then reduce to a simmer and add 1 tablespoon honey and baking soda. Prep baking sheet with parchment paper or silicone mat for baking. 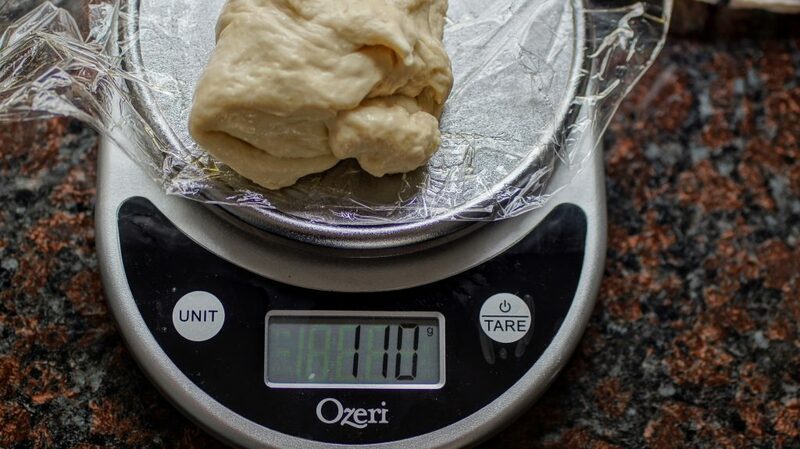 After the dough as risen slightly for 30 minutes, break dough up into 12 equal pieces (I like to use a kitchen scale to ensure accuracy, each bagel is about 110grams). Roll each piece into a long rope then shape into a ring, tucking the ends onto one another and leaving a center hole. Continue for all 12 pieces. 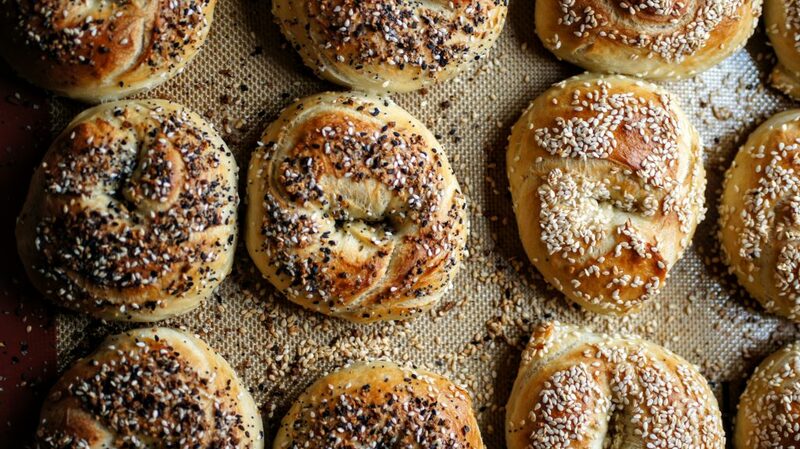 Line the prepared baking sheet with the bagels ensuring they stay covered with damp cloth and let rise for another 10 minutes. 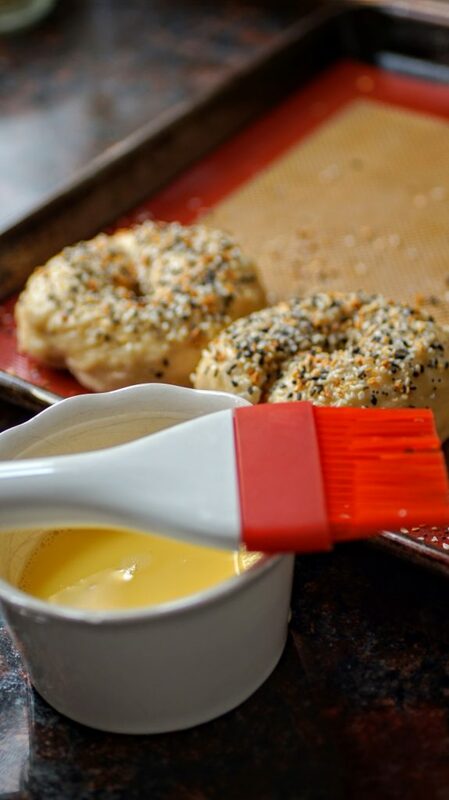 Line a 2nd baking sheet with a cooling rack to place bagels on to drain after boiling. 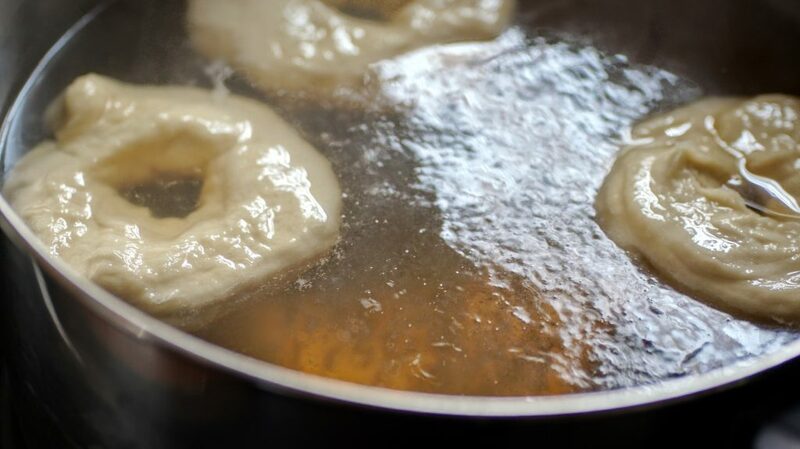 Boil bagels, usually about 3 at a time fit in the pot. Boil for 30 seconds, flip and boil for another 30 seconds. on Then remove with slotted spoon and place on the sheet pan lined with cooling rack. If you'd like to add any toppings (seeds) brush lightly with egg was on both sides and sprinkle or dip into seeds. Place on parchment/silicone lined pan to bake. Bake in oven in top 1/3 of oven for about 10 minutes, rotate to the bottom for another 5 minutes. You want both the tops and bottoms to brown but not burn. Bagels are best eaten fresh the first day. I like to split the bagels, wrap in plastic wrap then a large ziplock and stick in freezer to store extras. When ready to eat remove and toast frozen. I love to flavor my cream cheese with capers + chives + lemon. Nancy's Cream Cheese has a lovely thick consistency. These were so incredibly easy to make and turned out perfect. The dough was a little sticky. I added a tad of flour when in the mixer and when shaping, but was careful not to use too much. Also, I started my water to boil when I started the 30-minute rise. Doing this helped to time everything perfectly so that it was quick work. We ate three and froze all but a few so that we could enjoy them over the next week a little at a time. Great recipe and instructions. I’ll definitely be making these again! Thank you for a great recipe! I can see this being a holiday treat with lox and cream cheese! Hi Cosette, I followed your bagel recipe sort of …to start with I used freshly ground spelt 6 cups but it was way too wet had to add anything I could find- not your recipe’s fault-the flours are totally different. We “formed” our bagels but the wine made 8 instead of 12 hm. Non the less Uncle Kevin says “f#%king good! !” and I can’t stop eating what I call “the turds”- not picture perfect but delicious. our first attempt at bagels and we are stoked! Your recipe and instructions are easy to follow and we’re hooked. I will attempt a photo on Instagram .